SDM designs and manufactures tube processing equipment for eddy current flaw inspection, dimensional gauging, vision inspection, cutoff and facing, and ID and OD cleaning. 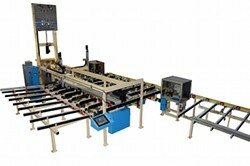 Servo-controlled handling provides accurate placement and delicate handling for different material tubes. This system performs multiple tests on nuclear industry tubing. Tests for straightness and concentricity, along with a vision inspection of side holes, are performed. The side holes are then sealed and the tube ends plugged for downstream ultrasonic testing. This system provides end cutoff and facing of tubes. It incorporates gauging to assure accuracy. This system produces accurate, burr-free cutoff and facing of different diameter tubes. Servo control allows for quick change over. This device performs chipless cutting of tubing. It travels with a moving tube to perform the cut on the fly. 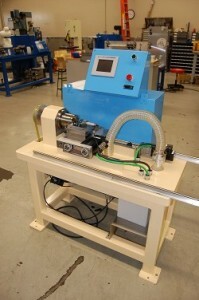 Servo control of the cutter wheels allows changeover to different diameter tubes. Speed of the traveling tube is calculated and matched by servo control. This system along with the tube handling provides a method of cleaning the ID of tubes by passing airborne grit through the ID, first from one direction then the other. An air blowoff then cleans the grit out of the tube. 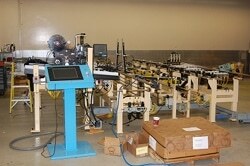 This system inspects strut bars for OD cracks using eddy current technology. The bars are rotated by driven skewed rolls and moved past the eddy current probe. This hand-loaded gauge uses a laser micrometer to measure the straightness of a length of tube. The tube is rotated and the OD position and diameter are measured. 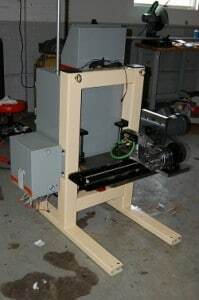 Another version of this test (not shown) is automated to position the micrometer at spaced intervals. Different diameters can be tested.